Running Press Adult, 9780762465286, 128pp. Lainey Morse didn't set out to start a fitness craze, but she got one when her yoga-instructor friend asked her if she could hold a yoga class on Lainey's farm. The appeal was immediately apparent, with word spreading quickly and waitlist developing almost overnight. Now, Lainey has people traveling from every corner of the globe -- from Iceland to Australia -- to experience goat yoga where it all began. 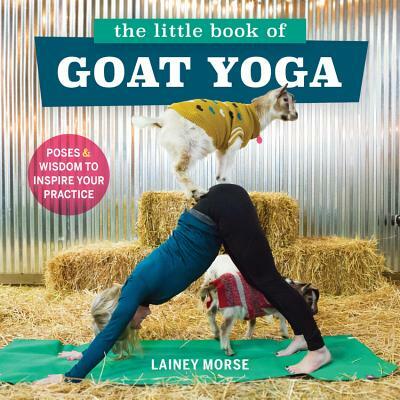 If you don't have goat yoga in your city just yet, this book offers a delightful "armchair goat yoga" experience, complete with adorable photos of Lainey's goats (each of which has a big personality and will be profiled in the book) and a gentle yoga sequence you can do with or without hooved friends. Originally from Michigan, Lainey Morse has lived in Oregon since 2006. Lainey has worked in the business development and marketing fields and is an award-winning professional photographer. She has a small hobby farm called No Regrets in the Willamette Valley where she lives with her 13 goats, four chickens, and three barn cats. She now works full time on developing her Goat Yoga business.